The course covers broodstock capture and transportation, handling and acclimation, biosecurity and probiotics, use of drugs (types and dosages of anesthetics, chemicals and antibiotics) and feeding schedules (weaning techniques, types of feeds and feeding schedule). Induced and conditioned spawning techniques are also covered. The course covers sampling techniques for determining sexual dimorphism and gonadal development. Design and management of maturation systems are covered, including tanks, heat exchangers, chillers, pumps, chemical and biological filters, etc. Students participate in broodstock feeding schedule and system management. Control of maturation cycles through photo-thermal manipulation and other environmental cues are also covered. 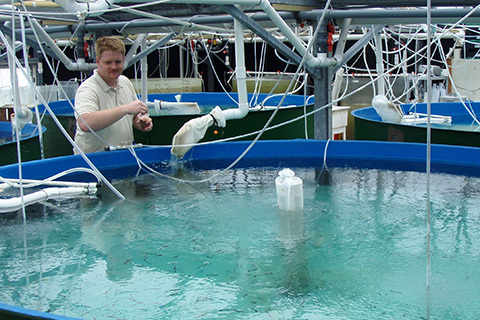 Spawning techniques, room design and management, including hands-on experience with hormone injections, implants, egg collection, disinfection, hatching, cleaning, stocking techniques and tank configuration are studied. The course also covers larval husbandry, nursery and growout techniques, as well as feeding practices and disease prevention and control. Students learn hatchery design and management, techniques for producing and enrichment of live feeds (microalgae, copepods, rotifers, Artemia) and feeding alternative feeds (natural zooplankton and liquid, semi-moist and dry artificial diets). Laboratory work is conducted at the dry lab and at the University of Miami’s Experimental Hatchery (UMEH).